I remember in the late 70’s and early 80’s there were predictions about our society becoming more and more paperless in the future with the revolution of the personal computer. But at the same time, huge companies were investing more and more into faster printers and fax machines that were in total contradiction of the predictions. Today with Internet becoming mainstream, environmentalism being a hot topic, and the fact that the technology has evolved so much, it may become a reality. After all, even an iPhone is a better computer than anything that existed in the 80’s. 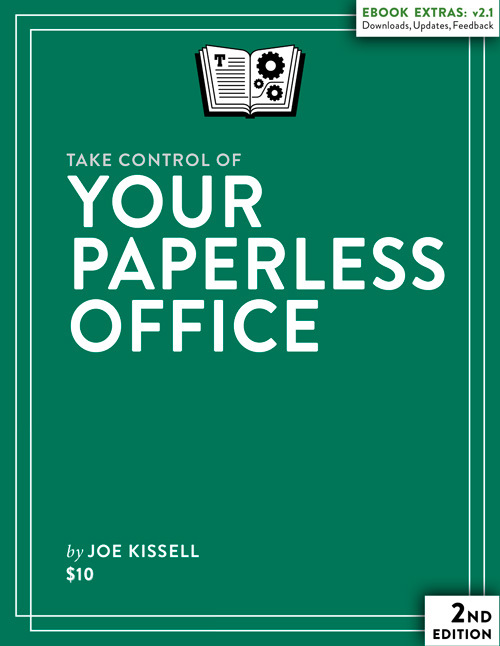 But how we proceed to go fully paperless is still a mystery, until you read Joe Kissell’s ebook Take Control of Your Paperless Office. At first, I was intrigued as to what a 146 page book can tell us about a paperless workflow. After reading the book, I can confirm to you, Joe Kissell really thought about it all to get you there. The book is much more than just a book on how to scan, file, and search (and making it searchable in the first place) your digital papers. The author has taken the time to think about everything that can be done to help, for example, limiting the number of things you receive via standard mail, and receiving digital copies of your bills. Almost one third of the book is dedicated to this subject alone. Then there is the equipment such as scanners, software, and online services to organize the digital papers, OCR (Optical Character Recognition) to help searching in the documents, and building a workflow that works for you. Overall, the book will give you many aspects to consider before even starting such a venture. I was expecting to see a one solution that fits everyone by reading the book; but that’s far from it. Kissel suggests many options and triggers many questions, more than provide a straight A-to-Z process to follow. It all depends on your situation and your needs. I realized that I already had some of the suggestions in place (such as eBills instead of paper bills), but there may be more to think about than just what I have in place now. For instance, my eBills are scattered in many different places: web site, email, on disk. This makes searching information more complex than it should be. In the end, Take Control of Your Paperless Office is a compendium of everything you have to understand before entering the paperless word entirely. There is so much to think about that reading the book once won’t be enough; I’ll have to review some parts of it and re-evaluate my paperless workflow. The only missing piece for me is a check list of required things to achieve my goal.